NETWORK UPDATE: There were no changes from this morning’s preliminary ratings. 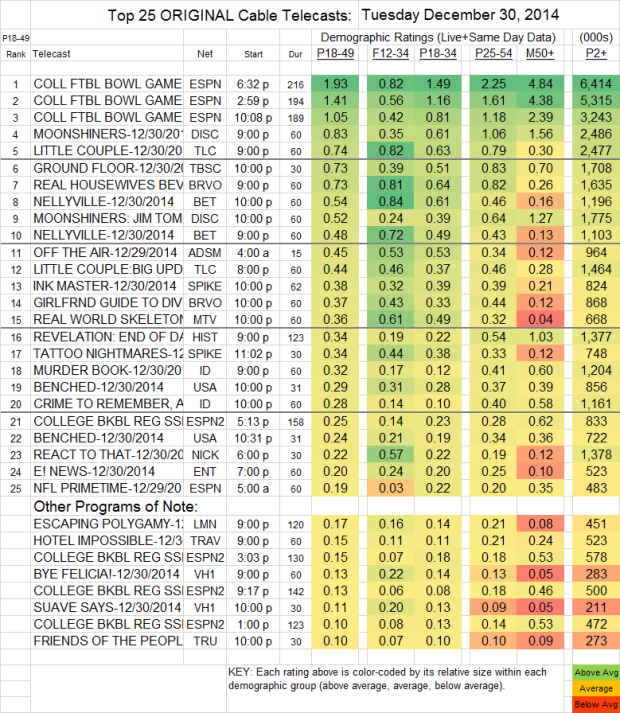 ESPN’s COLLEGE BOWL games were again in control of Tuesday cable, with games at 1.93/1.41/1.05. MOONSHINERS (Discovery) was at a steady 0.83, and a 10PM MOONSHINERS special was at 0.52. TLC’s THE LITTLE COUPLE leaped 0.29 to 0.74, with a lead-in special at 0.44. GROUND FLOOR (TBS) jumped 0.17 to 0.73. On Bravo, REAL HOUSEWIVES OF BEVERLY HILLS increased 0.19 to 0.73, but lead-out GIRLFRIENDS GUIDE TO DIVORCE only climbed 0.04 to 0.37. (In the network’s target demo of Women 18-34, REAL HOUSEWIVES was the #1 show of the night at 1.08, while GIRLFRIENDS GUIDE ranked #46 at 0.57.) 2 episodes of NELLYVILLE on BET were at 0.54/0.48, both way up from last week’s 0.35. INK MASTER (Spike) lost 0.12 to 0.38. REAL WORLD (MTV) gained 0.08 to 0.36. 2 episodes of BENCHED on USA were at 0.29/0.24, in the same range as last week’s 0.34/0.23. On VH1, BYE FELICIA and SUAVE SAYS were at 0.13/0.11, down 0.05/0.02 from last week. And in the ever-entertaining department of “What the hell are people watching on Adult Swim?”, the 4AM OFF THE AIR lost 0.06 from last week to 0.45–but that was still enough to make it the #11 show of the night.